I have been so wrapped up working on new things that I almost forgot to get this post done. It was rather embarrassing. Anyway, here is a fantasy set for the Ms. Mannequin series celebrating the winter time. The boots are trimmed in fur and the dress is decorated with a snowflake motif. Just for my readers who tell me that not every dress has to be worn with heels, I made these flat soled boots. I went back and forth on colors. Once I realized it was going to be posted on Christmas Day, I sort of felt bad that I didn’t think to color the dress in greens and reds. Oh well… I’ve not been very on the ball with my holiday themes anyway. Merry Christmas to anyone who is celebrating. And for those who aren’t, like me, I hope you enjoy your day. If you’d like to give the blog a Christmas present, than think about becoming a patron. The trend for this winter is sleeve detail. As I write this, I am wearing a flared sleeve sweater and that was a tame version of some of the things I have seen out there. I couldn’t imagine not creating some trendy sleeved tops for the Ms. Mannequins and here they are. The sweater is pretty close to what I am actually wearing today (though mine is a tunic and has a lace up neckline, so maybe… not that close?). Anyway… I’ve certainly seen sweaters like the one I’ve drawn for them. The blouse is floral (also a trend) and has ruffle details on the sleeves. 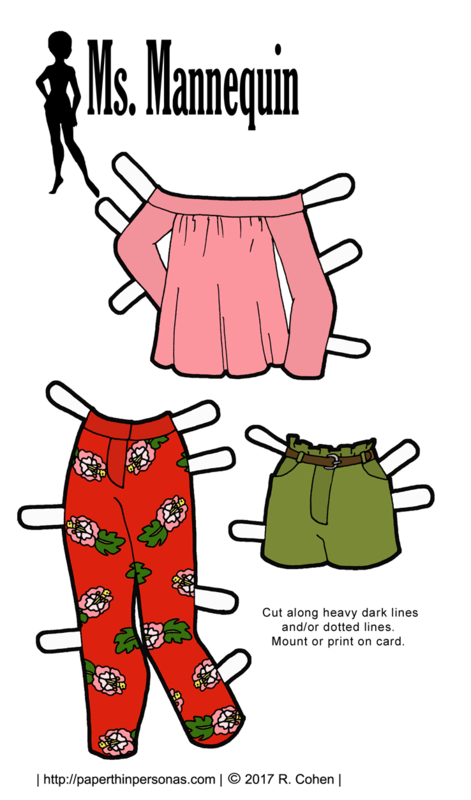 I tried on a blouse like that recently and I did not look good in it, but part of the joy of paper dolls is that they do not sure our own insecurities about their arms. Nor do they worry they will get the ruffle cuff in their soup when they try to eat it. Life maybe, I confess, easier if you are a paper doll. On the flip side, I suspect paper dolls have phobic feelings about puddles and being accidentally ripped in half. So, perhaps paper doll life would be more wrought with terror than I thought. Meanwhile, what do you think of today’s paper doll outfits? Would you wear crazy sleeves? Do you wear crazy sleeves? The pattern covers for Simplicity 7203 and Simplicity 7852 inspired today’s 1960s vintage paper doll dresses. The dress on the left comes from Simplicity 7852. Described as an a-line dress, the pattern offered two different colors and sleeve lengths. 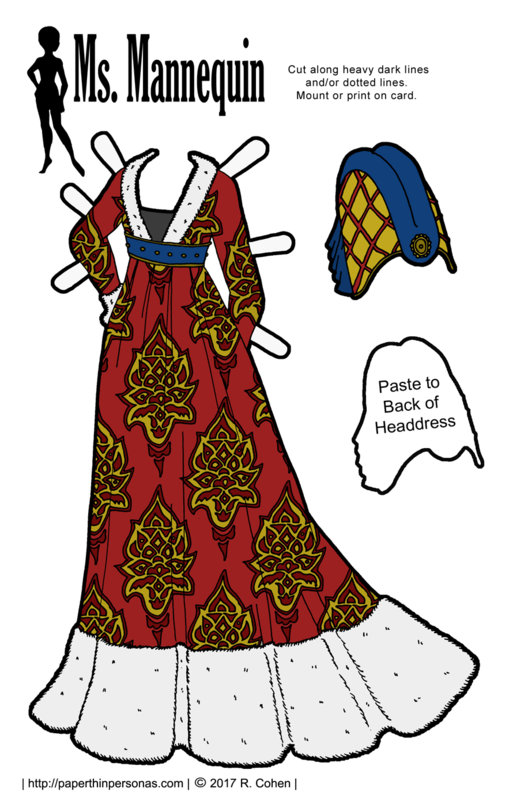 I chose the bib and contrasting collar for my paper doll version. I created Simplicity 7203’s tent dress on the right. The tent dress fell in a triangle away from the body and often featured a front pleat. Because I wanted to showcase the transition between the 1960s and 1970s, I chose the stand collar and pockets to go with my tent dress which isn’t really as wide as maybe it should be. 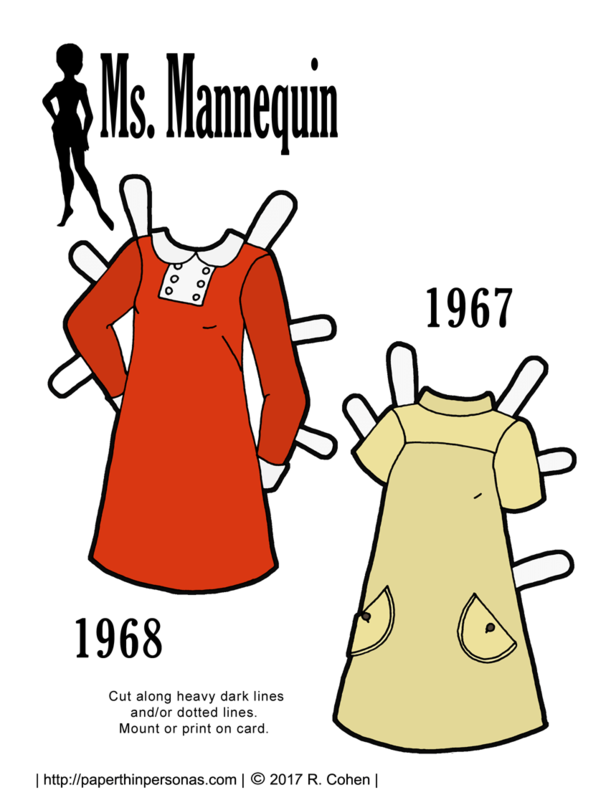 Drawing 1960s vintage paper doll dresses isn’t as easy as sometimes I think it should be. Also, can we pause and consider the name “tent dress”? Has anyone ever thought to themselves, “I want to look great! I’ll go put on a tent”? I mean… really? As some of you know, I love the Vintage Pattern Wiki whenever I go looking for vintage pattern covers to draw. Pattern Covers provide a window into what the more everyday fashions of the decade might look like. Sure, I adore Yves St. Lauren and Rudi Gernreich, but most people couldn’t afford those looks. Plus, Rudi Gernreich could be a bit out there. So, my question for all of you is this- Would you wear something called a “tent dress”? Let me know in a comment! I have kept seeing tropical prints this year. And patterned pants are in, so I decided to draw tropical printed patterned pants. A meeting of two worlds! 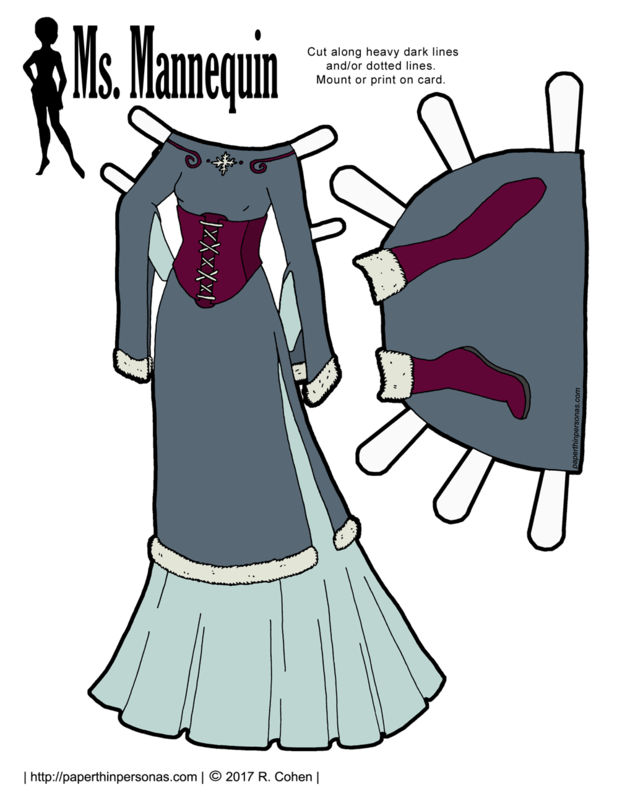 Actually, now that I mention it, everything in today’s Ms Mannequinn paper doll clothing set is super trendy. There’s paper bag waistband shorts and an off the shoulder top. Those are two other super important trends for this last summer. I guess I was just feeling super duper trendy when I drew these. It’s good I have paper dolls, because I never dress trendy. I don’t think cardigans have ever been that trendy. When I was coloring this set, I had a lot of fun matching the top to the colors in the flowers. And then using the green for the shorts. If you should chose to color the black and white version than I recommend playing around with the shades. I think a monochrome look with black and white could be also really dramatic. Drama in clothing can be fun. Drama in real life usually isn’t as much fun. So, let’s keep all drama to clothing. Meanwhile, what do you think of today’s paper doll outfits? Would you wear tropical print pants? Summer is finally coming to an end here in Alabama. When I went on my usual walk around the campus at lunch, I actually was grateful I had a sweatshirt to wear. Of course, tomorrow it might be in a 90s. If it stays cool, I’ll have to switch out my short-sleeved summer cardigans for my long-sleeved winter cardigans. The cardigan rotation is proof that fall is really here for me. 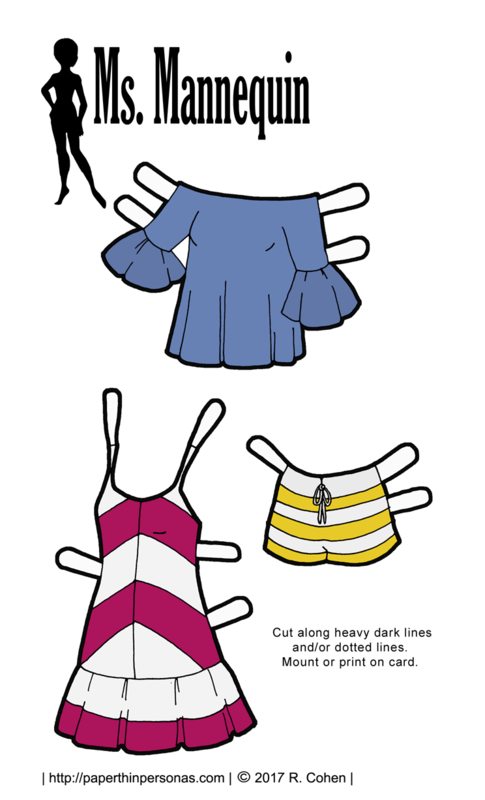 Meanwhile in paper doll land, I drew these paper doll fashions for the Ms. Mannequin paper dolls when it was still hot outside. So, think of these as a last summer set of fashions for them. Of course, knowing me, I’ll end up posting sundresses in December, because that’s just how I roll. The theme for today’s paper doll fashions is stripes. I’ve noticed a lot of stripes this summer, especially broad stripes. I wanted to play with color, but also shape. This may, or may not, explain the shirt with the flounce sleeves. Has anyone else noticed that flounce sleeves are making a comeback? I’m excited about this, because when I wear them I feel like a princess. In my head, that shirt’s made of chambray, in case anyone is wondering. 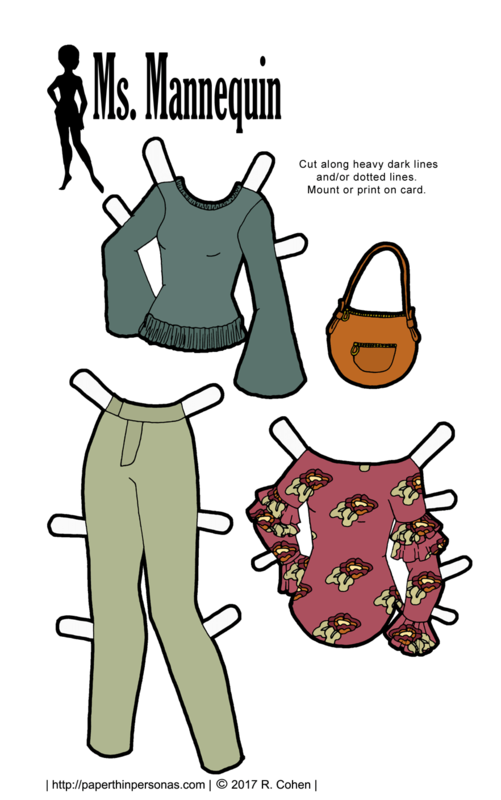 As always, I love to hear from you guys, so leave me a comment and let me know what you think of today’s paper doll fashions.